When I look at my 10 yr old son, who is almost as tall as me, I can’t even imagine where the time went. It still seems like yesterday I was fumbling with the diaper half dazed from my C section meds trying to figure out how to tie it on him the morning after he was born while the nurse looked baffled. Oh, and she followed it up with a, “You really haven’t seen anyone put a diaper on a baby, have you?” to which I promptly replied, “No”. He was all too yellow from jaundice and hiccuped a lot. The first time I changed his Onesie, oh my that has got to be one of the scariest experiences of my life. I was a nervous wreck thinking I might hurt him by putting it over his head! Once home, waking up in the middle of the night just to check if he is breathing. I don’t know if it just me, I had this paranoia with both my babies. Not just once, many times during the night I would sit by the bed and watch his/hers tiny tummy go up and down with the breathing and feel so revealed. I guess it was the realization that I was indeed completely responsible for this little being. Oh my, they grow up so fast! With so many things happening around us especially us mothers juggling many things at once, it is hard but we do need to take the time to stop and cherish every moment we get to spend with our kids. In honor of all the moms I know, here are some unique gift ideas. 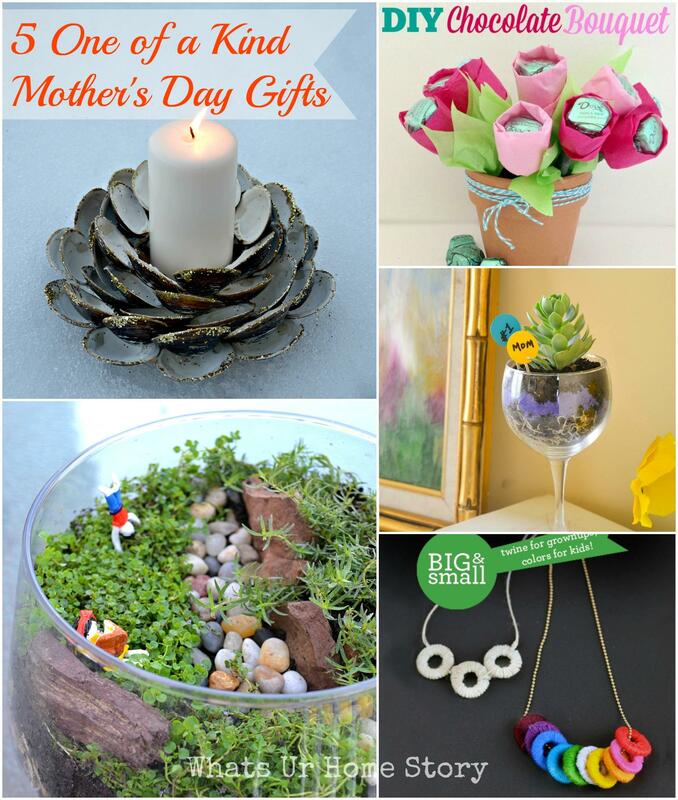 Isn’t gifting something handmade and from the heart the best way to celebrate the moms in our lives? Yes, it does require some hot gluing skill but all those burn marks are totally worth it. The easiest way to get this many clam shells is to buy them at your grocery store fresh. Maybe you can help yourself to a mouth watering linguine recipe and use the shells to make the special gift. You can find the instructions over here. My friend Melissa from The Happier Homemaker made this adorable bouquet with chocolates and tissue paper. Won’t this be a cute craft idea for the kids to make as a gift for Grammy? Handmade doesn’t get easier than this wine glass planter. Maybe we could get the dads to make it for the moms in their lives? This is an upgraded version of the wine glass planter only in a larger scale. 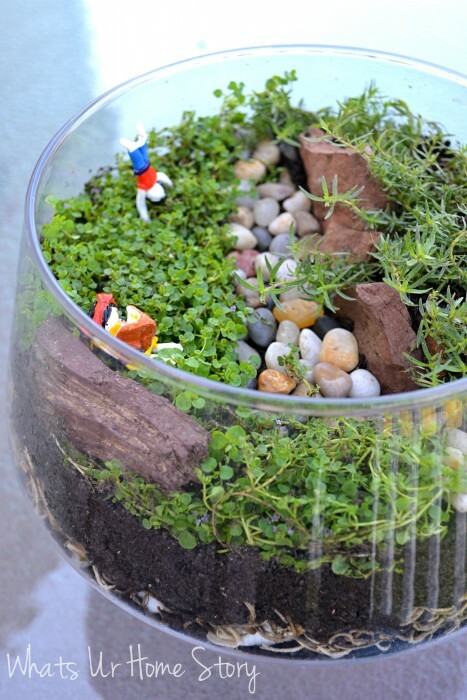 Since it is an open terrarium it is easier to maintain. Tutorial over here. I don’t usually feature jewelry over here but these necklaces by Design Mom are so darn cute I couldn’t help it. Also, can a woman say no to jewelry? Plus, these are made from washers! Yes, the same washers I used to make my laundry room chandelier! What are your plans for Sunday? To all the moms out there, Happy Mother’s day in advance! Thanks for including my chocolate bouquet Vidya!! Great gifts, Vidya! I, too, used to wake up in the middle of the night to make sure my son was still breathing… He was and just turned 19 years old! Phew, it is a relief to know that I’m not the only crazy one! And Happy Birthday to your son!